It is easy to spot a runner who is focused on their running and are determined to achieve the best in their careers. Nolene Conrad, with her enthusiasm about running marathons will be one of the athletes to watch out for during the 2019 IAAF world championships in Doha, at the Tokyo Olympic Games in 2020 and in the years to follow. Even on a festive season when most of the runners are taking short breaks from their running, the South African athlete, together with a pace setter she brought along, has been out training in Iten ahead of 2019, a year in which she has many ambitious plans to achieve. She wants to get an Olympic qualification time as early as she can in order to represent South Africa at the Tokyo Olympic Games in 2020. Already, she is in the team to represent her country in marathon at the IAAF world championships in Doha next year, and may be coming back to train again in Kenya, for about three weeks ahead of the world championships. "In order to take my marathon running career to the next level, I saw that Kenya would be the ideal place for me to do my high altitude training, to train with some of the best world distance runners and to experience the culture of running here," said Nolene. "The first time I came here with my friend, we loved everything about Iten; a lot of gravel routes, so many runners around that make you feel you are not alone, the nice and welcoming community, safety while running, the food and the favorable climate are all part of the reasons why I will always be coming back to train here." 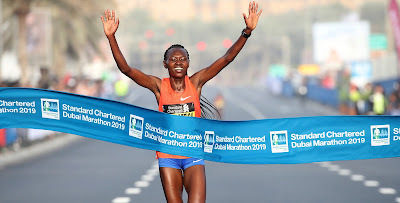 Her first visit to Kenya early this year did pay for her as she later went ahead and set personal best times for the half marathon (1:11:44) in March and for the marathon (2:34:39) in September. Her half marathon time looks impressive, but she likes the challenge of the full marathon distance more and is now putting more focus on the distance. She even had to come along with her personal pace setter to Iten. "Not that it is hard to find someone to run alongside in Iten, but I want to make sure that I get used to my pace setter in training so we understand each other more during the race," said Conrad. Some of her role models include Mary Keitany of Kenya and Desiree Linden of the USA. Not only is Nolene a great fan of running, but it is as though she is doing it in order to give back to a hobby that saved her life. "At the age of 13, I was diagnosed with Asthma. It got progressively worse every year. I had been in and out of hospital many times until one time I had a near fatal attack at my parent's house that changed my life. They called the ambulance and it came just on time to save me. I remember waking up later at the hospital, having been unconscious, and the doctors had told me that if the ambulance had taken one or two minutes late, then I probably would not have made it. While I was in hospital for that whole week, one of the doctors told me that I must start running or swimming to improve my lung capacity since it was just getting worse and that if I was not going to do something about it, then I was not going to live past 21 years," Said Nolene, who is now 33 years old and manages a group of 40 young athletes from her country. It was hard at first when her friend introduced her to cross country running after she came out of the hospital. The runs would often trigger asthma attacks. "I remember some of my teachers getting concerned that running was perhaps not good for my health as I would often need some medical attention. Sometimes, the asthma pump could not even work when the asthma was so bad and they would call an ambulance and the medical staff would bring a nebulizer," Nolene said. But, she kept running. With time, she now finally feels completely free from the Asthma attacks. "I have never had any Asthma attacks the past three years. I guarantee I do not need Asthma pumps any more. I don't keep any in my house now!"